Research has found that canines, like their human companions, can suffer from sensitive stomachs. And, just like humans, the culprit for sensitive tummies in dogs is certain foods. Common ingredients that are linked to stomach issues include lactose, gluten, and fructose. If your dog is showing signs that are indicative of intestinal upset – loose stools, constipation, and increased flatulence, for example – make sure to have him checked out by your veterinarian before you assume that his tummy troubles are related to his food. In some cases, a sensitive stomach is a sign of a more serious health problem. But, if your dog is cleared of health issues and it is determined that his stomach troubles are related to certain foods, you should consider switching the current dog food that you are feeding him to a dog food that is formulated for sensitive stomachs. The best dog food for sensitive stomach features limited ingredients; in other words, the formula is free of ingredients that are commonly linked to gastrointestinal upset and can lead to digestive issues. But, there are a lot of dog food brands on the market that contain limited ingredients and claim to be specially formulated for tummy troubles. With so many options to choose from, trying to select the best food for sensitive stomachs to fill your pet’s dog bowl with can be a challenge. To help you determine which food to choose, we’ve assessed several brands of dog food for sensitive stomachs and selected what we consider to be the top five options. What Causes a Sensitive Stomach in Dogs? Now that you have had a look at our top five sensitive dog food for canine stomachs, let’s take a closer look at each one. Below, we offer a more detailed overview of each product. We discuss the ingredients they feature, what we like about them, what pet owners who have used the products have to say about them, and why we think they are the best dog food for dogs with sensitive stomachs. After you read through the reviews and decide which option will best meet your pup’s needs, click on the buttons to find the best prices currently available on Chewy and Amazon. Hill’s Science Diet is regarded as one of the best pet food manufacturers. They truly understand the needs of dogs and ensure that they are meeting those needs by offering them food options that contain the highest quality ingredients. Their Adult Sensitive Stomach and Skin formula is specifically made for canines that suffer from digestive issues, as well as dogs that have skin sensitivities; so, it’s a food for sensitive stomachs, as all as a dog food for allergies that result in skin issues. Made with premium quality ingredients that are easy to digest and offering a bevy of essential vitamins and minerals for well balanced nutrition, this food will surely tame your pup’s stomach, and any skin issues he may be experiencing. Typically, the first ingredient used in a premium dry dog food is protein; however, in this Hill’s Science Diet formula, the first ingredient is brewers’ rice, followed by chicken meal. Since brewers’ rice is easier to digest and its protein content is lower than chicken, so using it as the first ingredient is believed to reduce stomach issues. Other ingredients featured in this formula include cracked pearled barley, pea protein, carrots, broccoli, cranberries, green peas, and apples; all of which are easy to digest and therefore reduce tummy troubles. It’s also infused with a blend of antioxidants, vitamin C, vitamin E, and other nutrients that are proven to improve digestive health, strengthen the immune system, and nourish your furry pal’s skin and coat. And, since it’s formulated for dogs of all ages, sizes, and breeds, it’s suitable for adult dogs of all breeds and sizes, so it can be used as a dog food for Dachshunds, a dog food for Jack Russells, a dog food for Dobermans, a dog food for Rottweilers, and any other breed, too! Lastly, it’s free of artificial colors, flavors, and preservatives, ingredients that are often used in other pet food formulas and have been found to complicate stomach and skin issues. 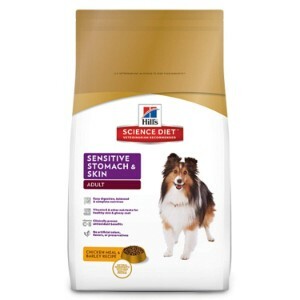 Final Verdict: Hill’s Science Diet Adult Sensitive Stomach & Skin Dog Food is specially formulated with premium quality ingredients that are proven to be easy to digest and enhance skin and digestive health. If your adult pooch is suffering from tummy woes or skin issues, this recipe from Hill’s Science should offer positive results. Another high quality dog food for sensitive stomachs comes from Purina. Their Focus Sensitive Skin & Stomach Adult Dry Dog Food is formulated to ease stomach issues and reduce skin irritations, too. It’s completely free of corn, wheat, and soy; ingredients that are difficult for some canines to digest and have been proven to irritate the skin of some dogs, as well. It’s also free of artificial colors and flavors, and poultry byproducts, which are other ingredients that are found in many brands of dog food that have also been found to cause tummy troubles and skin issues. 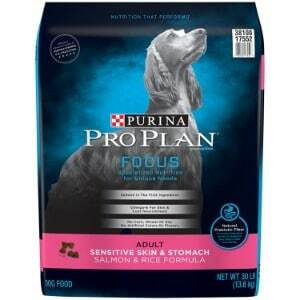 The first ingredient used in this sensitive skin and stomach formula from Purina Pro Plan is salmon. Salmon is a premium source of protein, is packed with essential nutrients, like omega 3 and omega 6 fatty acids, and is easy to digest, so it can ease sensitive stomachs and nourish the skin. And, while salmon is an excellent source of protein, this formula is considered a low protein dog food, as it has a lower content of this nutrient to further support digestive and skin health. Infused with a wide variety of vitamins and minerals, such as B vitamins, vitamin K, vitamin #, potassium, zinc, and copper, this dry dog food supports optimal health for your canine companion. The addition of glucosamine also helps to support joint health, which is important for dogs that suffer from joint issues like hip and elbow dysplasia, such as Mastiffs, Great Danes, and Saint Bernards. Final Verdict: Purina Pro Plan Focus Sensitive Skin & Stomach Adult Dry Dog Food is made specifically for canines that suffer with sensitive skin and stomachs. It features prime ingredients, such as salmon, and offers essential nutrients to support optimal health in adult dogs. 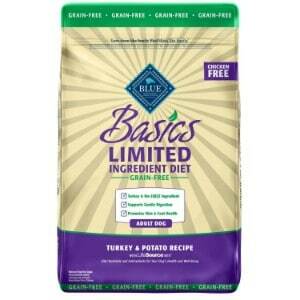 Next up on our list of the best dog food for sensitive stomachs is Blue Buffalo Basics Limited Ingredient Diet. Blue Buffalo is one of the most trusted pet food manufacturers, as all of they use only all natural ingredients in all of their formulas. This recipe is made specifically for canines that are plagued with sensitive tummies and/or skin sensitivities. The first ingredient featured in this formula is natural deboned turkey. Turkey is not only easier to digest than other forms of meat, but it’s also an excellent form of protein. Instead of using carbohydrates like corn, wheat, or soy that are difficult to digest, this Blue formula features pumpkin, potatoes, and peas, which are gentle on the digestive system and contain tons of vital nutrients. Other ingredients include cranberries, blueberries, and flaxseed for a well-balanced, delicious, and nutritious meal. The infusion of glucosamine and chondroitin help to support joint health, which is important for adult dogs, and vitamin C and E supplements nourish the skin and strengthen the immune system. Like all Blue dry food products, this formula contains Life Source bits, which contain a precise blend of vitamins, minerals, and antioxidants that are proven to promote healthy oxidative balance. Final Verdict: Veterinarians suggest feeding dogs that have sensitive stomachs limited ingredient diets. Blue Buffalo Basics Limited Ingredient Diet only contains natural ingredients that are proven to improve digestive health and support the overall well being of canines. For large breed dogs that are exhibiting signs of digestive troubles, like Newfoundlands, Rhodesian Ridgebacks, or Alaskan Malamutes, Royal Canin Maxi Nutrition Sensitive Digestion Dry Food for Dog is a great option to consider. It’s specifically formulated for dogs that weigh 55 pounds or more, as it contains nutrients that are proven to be beneficial for large dogs. This formula is infused with a variety of vitamins, minerals, and other nutrients to support proper health in large breeds. Glucosamine, for example, has been proven to strengthen the muscles and improve joint health, while calcium promotes stronger bones, and Omega 6 fatty acids can help to improve skin and coat health. Prebiotics help to promote better digestive health, thereby easing sensitive tummies. However, it should be noted that this food does feature some ingredients that can be difficult for some dogs to digest, such as corn gluten meal. However, with that said, many pet owners have reported that they are pleased with the results, as this formula does help to ease upset stomachs. 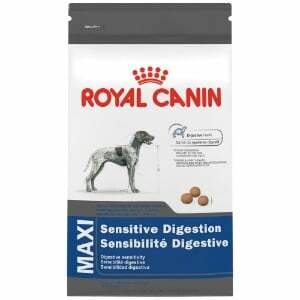 Final Verdict: Royal Canin Maxi Nutrition Sensitive Digestion Dry Food for Dog is made specifically for large breeds that experience tummy troubles. The formula contains ingredients that are supposed to be easy to digest and most pet owners say that they are pleased with the product. If your canine companion has a sensitive tummy and/or sensitive skin, but he’s a finicky eater or has a hard time chewing dry kibble, feeding him a wet dog food that’s specially formulated for tummy and skin troubles is an option to consider. 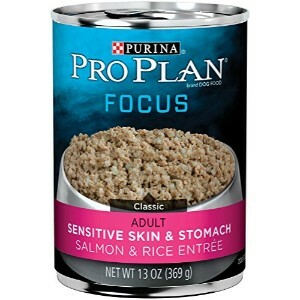 Purina Pro Plan FOCUS Sensitive Skin & Stomach Classic Salmon & Rice Entrée Adult Wet Dog Food is made specifically for dogs that have picky palates or issues eating dry food and suffer from delicate stomachs or skin troubles. This Purina Pro Plan formula is designed to offer dogs that have unique dietary needs well-balanced nutrition. Featuring salmon as the primary source of protein, omega 6 fatty acids, and linoleic acid, this wet food is made to be gentle on your four-legged family member’s sensitive stomach and nourish his skin and coat, too. It also contains a wealth of vitamins, minerals, and nutrients that are proven to enhance the overall health and well being of adult dogs, like inulin, carrots, B vitamins, vitamin E, zinc, folic acid, and thiamine. And, since it contains no wheat, soy, artificial colors, or artificial flavors, you can have confidence knowing that your pooch will be receiving well-balanced nutrition. Final Verdict: Purina Pro Plan FOCUS Sensitive Skin & Stomach Classic Salmon & Rice Entrée Adult Wet Dog Food is specially formulated for adult dogs that suffer from sensitive tummies and skin. The taste, according to most customers, is very palatable for dogs; but, do be sure to read ensure that the ingredients are suitable for your pooch, as some pet owners said that it upset their dogs’ stomachs. As a pet parent, you’re top priority is making sure that the furriest member of your family receives the very best of care. To ensure he lives a happy and healthy life, you choose the highest quality products for your pooch; from the dog treat you offer him as rewards to the dog collar and dog harness he wears while taking walks. But even with the best quality products, he can’t live his best life unless you are feeding him a well-balanced, delicious, and nutritious diet that meets his nutritional needs. The nutritional needs of some dogs are more unique than others. For example, if your pooch has a sensitive tummy, then it’s a wise idea to consider feeding him a food that is specially formulated to be gentle on his digestive tract and ease his tummy woes. But how can you tell if your dog needs a dog food for sensitive stomachs? What causes a sensitive tummy? What are the benefits of feeding your four-legged family member sensitive stomach dog food? Find out the answers to these questions below. If your dog is showing any of these signs, make sure to take him to the vet to have him checked out. While these are all signs of sensitive stomach, these symptoms can also be linked to more severe health issues. As such, it’s important for your canine companion to have a full exam to accurately determine the cause of his symptoms. Food sensitivities or intolerances. Like people, some dogs cannot tolerate certain types of foods; grains or lactose, for example. When they consume these ingredients, their system can’t properly digest and absorb them, resulting in tummy woes. Improperly balanced healthy bacteria. Also like humans, the intestinal tract of a canine contains bacteria that are supposed to aid in digestion. But, if there are any changes to the function of your pet’s immune system, this healthy flora can be killed off, which can lead to digestive issues. Reduced stomach issues. It goes without saying that the biggest benefit of feeding your furry pal food that is made for sensitive stomachs is a reduction in stomach issues. When ingredients that are causing his digestive issues are eliminated from his diet and he is eating foods that are easy to digest, his symptoms will drastically subside. Improved health. When your pup is better able to digest the food that he is eating, his overall health will improve. He’ll be able to absorb more nutrients, which will certainly make him a healthier pup. Additionally, other symptoms that he may be experiencing, such as skin issues, may also subside. Improved attitude. A pup that feels more satiated, is healthier, and is more comfortable is a happy pup. Your pet’s attitude will also likely improve when you offer him a dog food for sensitive stomachs. By feeding your canine companion a dog food for sensitive stomachs, you’ll notice a marked improvement in his overall health and well-being. Make sure that you confirm that his digestive issues are, in fact, related to his diet; and if so, ensure that you are selecting only the highest quality food choices that contain premium quality ingredients. All of the options listed in our review are specifically formulated to meet the unique nutritional needs of dogs that suffer from tummy issues and should offer noticeable benefits shortly after switching his diet.